Simply put, not one of Steve’s friends from Chicago knows how to tie a bow tie. Pretty funny, seeing as one of their best buddies owns a men’s accessory brand. If Steve had a nickel for every time he’s gotten that last minute phone call, begging him to come over and tie a bow before his friend heads to a black tie event or wedding, he’d be a wealthy man, or have over $1.50? This problem is solved with Bird Dog Bay’s signature bow. Each of our bows is outfitted with a fastener next to the hardware slide. This allows the bows to be tied then unhooked, keeping the bow still intact for the wearer to simply wrap it around his collar and hook it in the back. Easy breezy. 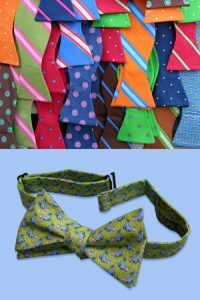 If you would like us to pre-tie your bow, like the photo to the right, simply note this in the “gift note” box at check out. Additionally, our bows’ neckpiece is cut a bit longer than most traditional bows. They will fit a neck size of 15″” as well as the NFL linebacker with a 19.5″” neck. That’s pretty big! Finally, all of our bows are cut on the bias so Steve’s illustrations run straight across the bow, instead of a straight cut where they would run on a 45-degree angle. It is critical to Steve that his designs read correctly, the specific way he carefully drew them for our four-in-hands. Of course, the bows are 100% silk, hand-printed, and hand-made.